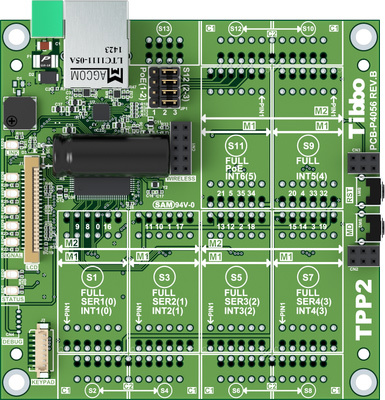 Offering 3 tiles for a total of 6 Tibbit module and 6 Tibbit connector sockets, the TPP2(G2) can be used to create TPS configurations with up to four serial ports, up to 12 relays, or up to 24 control lines, such as opto-inputs, PWMs, or open-collector outputs. This product can be used as a bare board or assembled into a size 2 Tibbo Project Box (TPB2). The board is also compatible with and can be assembled into the TPB2L, which features a 320x240 TFT LCD and a 4-button sensor keypad. The TPP2(G2) is perfect for systems with a medium number of I/O lines. Since the board can control a TFT display and a keypad, it is suitable for applications requiring a human-machine interface (HMI). The board is an ideal choice for automatic identification and data collection (AIDC) systems, as well as factory, shop, data center, hotel, and home safety, security, and automation applications. The TPP2(G2) is supported by our Online Configurator. The configurator allows defining custom TPS systems, which can then be ordered from our online store. The board is an improved version of our original TPP2 device. Compared to the TPP2, the new TPP2(G2) boasts a much higher performance, as well as larger flash and RAM. The TPP2(G2) runs Tibbo OS (TiOS) and is programmable in Tibbo BASIC and Tibbo C.